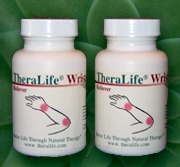 TheraLife® Wrist is among the most effective natural remedies for wrist pain. It is an herbal-based product that can help provide support for sore and aching muscles, joints, and tendons. TheraLife® Wrist helps alleviate aches and discomfort in the wrist and elbow that may be caused by overuse or minor injuries. These conditions are often experienced by athletes and computer users – sometimes known as carpal tunnel syndrome. Whether your wrist and elbow discomfort is the result of strenuous usage or simply everyday wear and tear, TheraLife® Wrist can help you. This blend of herbal extracts, vitamins, and minerals helps relieve soreness and numbness. It promotes improved circulation. It helps support healthy soft tissue and flexibility. It aids in rebuilding wrist and elbow tissues. It assists with and strengthening muscles and tendons. TheraLife Wrist works. The best of natural remedies for wrist pain.